This Bed and Breakfast is a wonderful get-away on the Island of Crete. Come and experience the fabulous joys of Greek life! 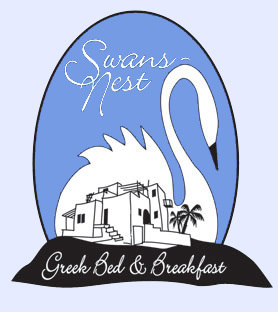 Nestled on the north west coast of the Akrotiri peninsula of Crete, overlooking the beautiful Souda Bay, Swans-Nest offers a peaceful retreat that is rich in history. Nearby beaches, archaeological ruins and a wide variety of activities provide a perfect holiday experience. NEW! Special offer! Looking for an exteded stay? Weekly or monthly rates now provided HERE.